Before looking at specific river landforms it is important to look at how the river channel itself changes downstream. We have already looked at how the river channel in the upper course is shallow and narrow with large bedload that disrupts the efficiency of flow. The bedload is derived mainly from mass movements from the valley sides and eroded rock from the bed and banks of the channel. The valley profile is really just an extension of the channel itself; it follows a symetrical v-shaped form. 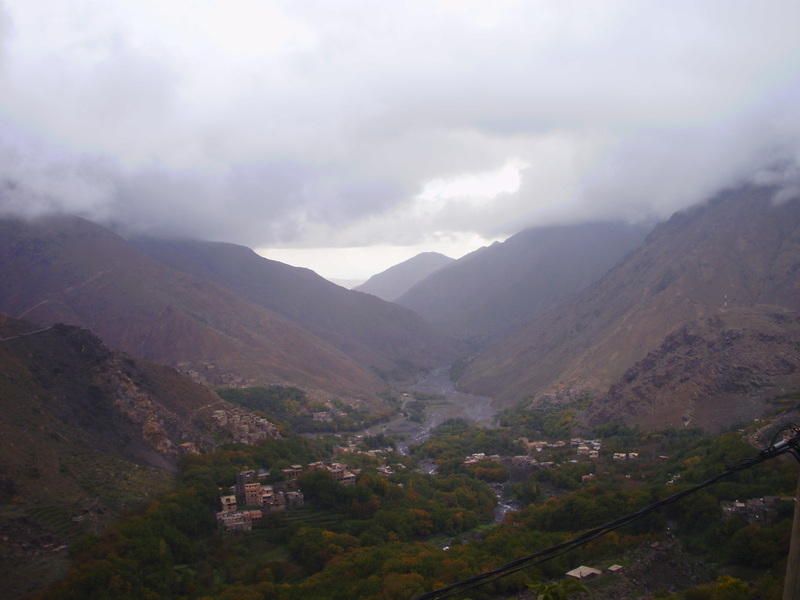 This narrow valley and river channel is caused by vertical erosion as a result of the high potential energy of the river. As the river stretches downstream both its velocity and discharge increase. Its velocity increases due to more efficient flow and reduced channel roughness. The discharge increases because the catchment area of the drainage basin has increased along with the number of tributaries feeding water into the river. As a result of this increased discharge the river, in its attempt to balance its energy erodes laterally, widening as well as deepening the river channel. At times, the river will exceed the banks and flood across the flatter section of the valley, initially in a youthful phase a floodplain may be eroded out of the valley. Over time a flat extended floodplain devlops either on both sides of the river or dominant on one side. Again in an effort to balance its energy and discharge the river will meander, creating asymetrical river channels; characterised by steep river cliffs on the outside bend of the meander and gentle slip-off slopes on the inside bend of the meander. Unregulated floodplains support permanent and semi-permanent wetlands. Further downstream the floodplain grows in size on both sides of the river as the river channel grows in width and depth. The channel shape becomes once again more symetrical as the channel widens. The meander length and meander belt both increase in size and the erosion of the outside bend slows down. Rivers are constanlty modifying their channel and surrounding landscape. As a result of the potential energy (derived from the gravitional force) as well as its kinetic energy (derived from it movement downslope) the river cuts vertically into channel. 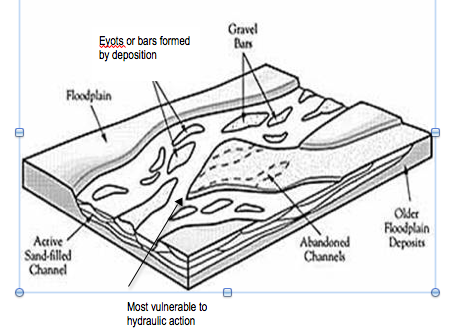 This creates initially a deepened channel, as a result of hydraulic action and abrasion; solution may also be present if the river cuts down to the bedrock layer. If this process acted in isolation the channel would take on a very acute, steep v-shape form. However, due to surface run-off, soil creep and other mass movements the valley sides become more gentle. Weathering processes may also aid this breaking down of the valley side. Rivers will always choose to take the most efficient route downslope. If the river flow encounters an obstacle of resistence. e.g. some densely rooted soil, it will change direction and flow around that obstacle. In doing so, it preserves energy and takes the most efficient route. These changes in direction are the birth of hillside spurs. As the river cuts deeper, its valley becomes more pronounced and recognisable. It is normal for a river to make subtle changes in direction repeatedly in its flow downslope; in doing so, interlocking spurs form. 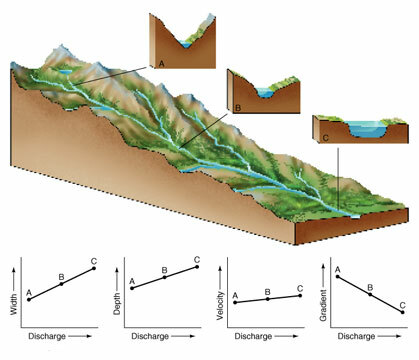 These changes in river landscape can be seen in the diagram above and are also also superbly animated below. Finally, and very briefly, it is important to understand that the size and scale of v-shaped valleys with their characteristic interlocking spurs reflects the maturity of the landscape. As the landscape matures v-shape valleys become more established. Its channel deepens and at the same time the spurs grow in size. Having said this, v-shaped valleys and interlocking spurs are only a feature of relatively youthful river landscapes. A more mature river valley will have flattened out and developed a floodplain. Weathering and mass movements will have almost fully removed any higher relief. V-shaped valleys and interlocking spurs of varying scale can be sen in the photos below. Potholes form mainly in the upper course of the river, in high altitude where the river channel cuts directly into the bedrock. Potholes are the direct consequence of vertical erosion and processes of abrasion. The sequence of the development is quite easy to understand. As we know the river channel in the upper course is characterised by roughness, associated with large bedload. As water flows over still standing bedload on river bed it is forced over the obstacle and to eddie behind the rock downstream. This turbulence forces water down on to the bedrock. Over time small depressions within the bedrock develop. We can see a similar process of turbulent wind movement and eddie development as wind collides with tall building in cities. This is illustrated below. Over time, the turbulent flow deepens the depression in the bedrock to form a small circular basin, just a few centimeters in diameter. This development creates a positive feedback, which further increases the turbulence of the water and the development of eddie currents. It is this turbulence which creates localised variations in the speed of erosion. As we can see in the diagram below, the hollow deepens further to form an established pothole. It is then possible for smaller bedload to become trapped in the pothole. This debris is then used to abrade the sides of the pothole. 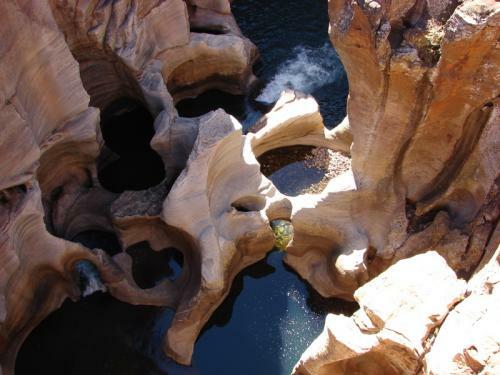 Over time the pothole will deepen and become more circular; the diameter of the pothole increases in size and often multiple potholes form and merge as shown in the Blyde River. The Bourke Luck Potholes are particularly spectacular as the sand stone bedrock rapidly erodes forming a gorge within the river valley. Rapids are most commonly found in the upper course of the river and form as a result of the river cutting down rapidly in a localised section of the river. They may form downstream of a waterfall that has retreated headwardly or they may mark the point of a previous waterfall section. They can be found in other sections of rejuvenating rivers and are located at the knick point of the river. The main characteristics of rapids are distinctly steeper gradients marked by steps in the channel and high turbulence, which is the result of large bedload in the channel or steps. It is common that rapids form over different bands of geology that vary in resistence or where the river is transporting large resistent bedload. The velocity of the river is noticeably faster at rapids but not efficient in its flow. Due to the roughness of the channel, flow is turbulent and known as white water. This white water is thrown up and characterised by eddie currents. Waterfalls like rapids form mainly in the upper course as a result of differentiated erosion. If the river channel flows across different bands of geology with varying resistence, then the softer less resistent rock will be eroded faster creating a step in the river. The hydraulic action of the water enlarges this step over time creating the waterfall. Due to the force of the water a deep plunge pool forms at the base of the waterfall. Turbulent flow with eddie currents and splashback undercuts the cap of resistent rock headwardly, untill the undercut is significant enough for the rock above to collapse under its own weight. 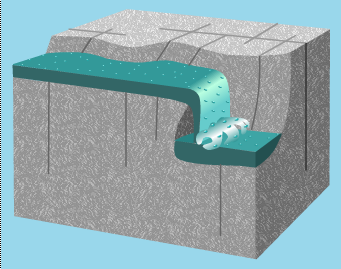 This leaves angular resistent bedload in the plunge pool, which will combine with hydraulic action to further deepen and undercut through the process of abrasion. Over time the waterfall becomes higher and retreats upstream. As the waterfall retreats a deep gorge with steep U-faced sides forms down the length of the river and marks the length of retreat. Waterfalls are a significant example of both vertical and headward erosion. The process is visualised in the animation below. It is also important to realise that there is much variation in the form and ongoing processes of waterfalls. Waterfalls also vary in location depending on the processes that formed them. The diagram to the left shows a classification of different types of waterfall. The ability of these rivers to cutback will vary depending on the geology around them and velocity and discharge of the flow. Waterfalls form due to different factors. If the sea level has fallen, either due to greater storage in ice sheets or because of isostatic rise of continents, (explained later) there will be an increase in the potential energy of the river. This energy is derived from the rise in elevation and the corrosponding increase in gravitational force. In this circumstance, the river will begin again to cut down vertically, starting from the mouth and forming either rapids or waterfalls. This point in the river is called the knick point and will retreat over time upstream to the source as a feature of a rejuventating river. Yosemite National Park. If a landscape has been cut out by valley glaciers, the resulting ladscape shows deep U-shaped valleys , characterised by almost vertical valley sides. Glacial fields behave very similarly to river drainage and have smaller glaciers feeding into larger glaciers like tributaries feed into the main river. In this case the small feeder glacier does not have the same weight and erosional power as the larger valley glacer and so doesn't erode as deep. The post glacial environment then returns to support fluvial systems and small tributaries follow the route of the smaller glacier. At the point of confluence a high hanging valley forms. Finally, waterfalls form when the channel crosses a fault line where tectonic processes have lifted or folded the rock. Waterfalls then tower over the resulting step in the rock. This can be seen at the Gullfoss falls in Iceland. Gullfoss is a 2-tiered waterfall with a total height of 32m (105ft). Also known as the Golden Falls, Gullfoss is part of the Hvítá river. Braided channels can form nearly anywhere along the course of the river but are most commonly found in the upper course, like with the Yellow River in China or at a river delta where the river breaks up into separate distributaries. 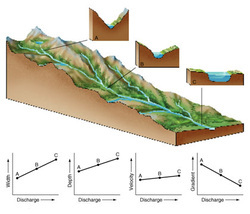 Braided channels are common river regimes, which are characterised by significant fluctuations in discharge and resulting capacity to transport bedload. They are common in Alpine rivers with significant snow melt as well as in dry/wet tropical climates that experience extreme rainfall events. Many arid and semi-arid regions have braided river channels. As the diagram above illustrates, braided channels are dominated by multiple channels (braids) and sedimanet bars (eyots). This unique channel characteristic develops due to changes in velocity and discharge. This occurs as part of its typical river regime. During periods of increased discharge, the capacity of the river to transport sediment increases and eyots become eroded. The competence of the river to transport larger bedload also increases. The braids widen and merge. In the timelapse video this process is described as avulsion. Avulsion takes different forms, sometimes expanding into a larger areas of the channel and sometimes sweeping across the channel. In doing so sediment banks shift. During periods of lower discharge, eyots build up due to reduced capacity in the channel. The channel profile is extremely dynamic and complex in its pattern of flow and deposition. The river is constantly converging and diverging in its attempt to find the most efficient route accross the channel. When channels diverge, sedimanet may fill-in between. When channels converge sediment will be eroded. Eyots are in constant change and can extend downstream and upstream depending on the varying pattern of velocity. Separate braids will have different velocities, faster flowing sections are known as chutes. A final but important characteristic of braided channels is the input of sediment. Grainy and loose sediment rather than coagulated sediments are more prone to change in terms of their transportation and erosion. This PowerPoint thanks to SLN summarises braided channel formation. 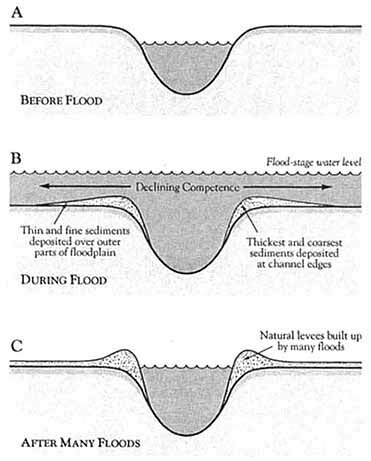 Floodplain evolution and its associated landforms goes well beyond the development and change of meanders, but many students miss the opportunity in their responses, to develop clear description and explanation of how floodplains develop. Examiners at Post 16 Geography and Geology try to tease student knowledge out by referring to the role floods have in creating specific features. Examiners are really interested in how students are able to assess the relative importance of erosion and deposition. As you can see from the diagram, there is a lot more to discuss than just meanders. As we have already learned, rivers increase in discharge as they move downstream. This in turns creates a wider and deeper channel and in the river's efforts to balance its energy the river becomes more sinuous and meanders develop. Intermittently, the rivers discharge will exceed the capacity of the river channel and overflow the river banks. In the early stages of floodplain development, a river cuts out its floodplain as its channel migrates. Channel migration, whereby the river changes direction and location is common in unregulated rivers. Channel roughness is increased due to vegetation growth, fallen trees create obstacles in the channel, even beavers are able to redirect the channel, so that the environment is in constant change. Some rivers like the Amazon have seasonal flloods, which totally submerge the floodplain creating stunning wetland ecosytems with unique flora and fauna. The following video of the River Kissimmee in Florida shows an excellent animation of floodplain inundation. The animation to the left shows how floodplains develop over time. Contrary to the notion that floodplains form through deposition they are in fact cut out by the erosive force of the migrating unregulated river channel. They are contained by the areas of higher relief on their sides, known as bluffs or in the case of rejuvenating rivers, alluvium terraces. The floodplain is well known to be a flat area of land on either side of the river and is made up of deposited alluvium from successive floods. Within the floodplain develop a number of distinct landforms, including levées, meanders, ox-bow lakes and meander scars. Unregulated rivers will also support rich wetlands drained by yazoo tributaries. Natural levées form as the river floods its banks and inundates the floodplain. As soon as the river overflows the bank, it comes in contact with greater surface area and friction. This increased friction in turn, reduces the velocity and energy of the river and its ability to transport bedload. As a result, the river has declining competence with distance away from the banks. Consequently, the river deposits its larger load first but continues to transport finer sediments further across the floodplain. The sediment profile therefore falls in size from the bank to the bluff. Due to larger bedload being deposited closer to the bank the bank becomes raised, forming gentle sloping banks towards the floodplain. 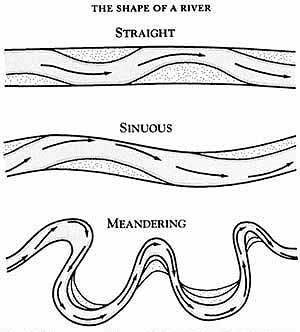 Meanders are sweeping loops or bends in the middle and lower course of the river caused by rivers developing increased sinuosity downstream. Meanders form through a combination of factors. These factors can be summarised as intrinsic and extrinsic factors. Intrinsic factors relate to the river's attempt to balance its energy, velocity, bedload and discharge. Extrinsic factors relate to the channel gradient and channel roughness. There is a lot evidence in rivers to show that as the river flows downstream its sinuosity increases; meanders develop and become more pronounced as discharge and capacity increases. We can observe an increase in both the size of the meander length and meander belt. The gradient of the river will also have an impact on the slow development of sinuosity in the upper course, as flow is moving downslope and eroding vertically rather than laterally. Meander evolution is therefore seen to be an intrinsic response to its own energy and discharge. However, the intrinsic argument doesn't fully explain the initial development of meanders. Something else is at work. As we can see from the shape of the river above, even straight rivers have a small level of sinuosity with the main chute switching from left to right and bars of deposition alternating along the banks. The extrinsic argument suggests that meanders form due to these variations in channel roughness. This often mimicks the valley profile with deposition forming on the flatter side and erosion cutting into the steeper valley. 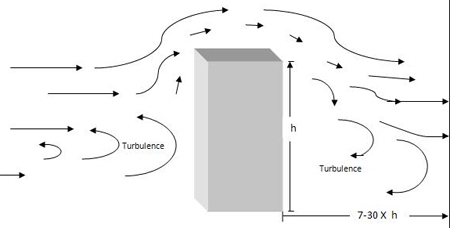 In other cases, a fallen tree or rock develops deposition and once the chute is diverted, a positive feedback develops, which further encourages deposition on one side and erosion on the other. This feedback manifests itself and even accelerates the process over time. The time-lapse video above shows meander initiation and is useful to see how river flow naturally forms loops as a balance to its energy and discharge. This model shows large variations in discharge so we can observe significant meander migration and braiding. It is useful as well to see how meander migration helps cut out a wider floodplain and form alluvium terraces. A positive feedback of increased velocity and erosion follows the line of fastest flow (thalweg) to the outside of the bend cutting out the river cliff and deepening the pool. Slower flow and deposition develops a point bar or slip-off slope on the inside of the bend. This can be seen in the asymetrical cross-profile at B. Overtime as the meander becomes more established the pool deepens as shown at C. Riffle cross-profiles develop between the loops on the straight sections. These are shallow sections, characterised by the deposition of bedload scoured from the river cliff of the previous meander loop. The pattern of riffle and pool distribution corresponds directly to the meander length. It is important at this point to examine in more detail, the proceses at work at the cross-profile of the meander. The helical flow of water plays an important role in the formation of meanders, especially in developing river cliffs and slip-off slopes. Higher velocity chutes within a stream tend to be driven to the outside of a meander seen at point 1. On the outside of the meander, the surface of the water has a tendency to be slightly higher because it has gained momentum and acceleration, in the same way as centrifugal force works. Here, the flow is forced down the outer bank which results in the scouring of the bank and bed. It returns to the surface toward the inside of the meander where flow is less turbulent, seen at point 2. This flow across the channel is known as the secondary cell. This can be seen in the diagram below. short life span due to a combination of deposition and evaporation. This leaves meander scars on the floodplain that simply mark the old channel. For more extended reading on meander processes the oxbowriver site is a useful read. River deltas form at the mouth of the river or inland on the approach to lakes. There is great variation in the shape of deltas due to the complex interaction between fluvial and marine systems. There are a number of ways to classify delta shape. The most common is to broadly identify them as arcuate, cuspate or birdfoot in form as, illustrated in the diagram above. Their shape is influenced by the amount and type of sediment being transported by the river, the velocity, discharge and capacity of the river and the strength of marine tides and waves. Arcuate deltas like that found on the Nile are the most common type of delta. They are characterised by a gently curving shoreline, smoothed by longshore currents. They have a distinct pattern of branching distributaries and tend to be dominated by courser material. Birdfoot deltas, are more distinct and are dominated by an extruding finger-like branch of depositio. They have fewer distributaries and fine sediments. They are formed due to weaker marine processes and high discharge. Finally, the cuspate delta is a little more difficult to recognise. They are quite varied but generally take on a tooth-like form. They are shaped by a gentle but regular opposing marine process. They are sometimes subject to longshore currents which redistribute sediment supply along the coast. Deltas only form in areas where the amount of sediment supply exceeds the rates at which it is removed. 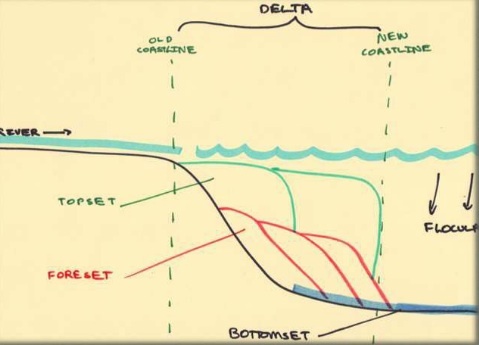 The extent to which sediment is removed is an important factor therefore in determining the delta shape. When rivers with high capacity reach the sea they encounter opposing tidal and wave currents. In the marine environment freshwater is also coming into contact with salt water, known as brackish water. At this interface, fine muds and clays transported in suspension coagulate with salt in a chemical reaction called flocculation. This process makes them heavier and they sink to the bottom. This process produces a varied composition of sediment in the Delta. Typically there are three types of sediment, Topset beds, Foreset beds and Bottomset beds. Topset beds are made up of larger bedload and are deposited first. Foreset beds are made up of more middle calibre sediments and are therefore transported a little further. They form steep like wedges, (illustrated below). Finally Bottomset beds, are finest sediments and therefore travel the furthest before low velocity and/or flocculation causes them to be deposited. Deposition at the delta is also animated in the following link. As has already been described, rejuvenating rivers form as a result of a fall in sea level, either as a result of an increase in ice storage or due to isotatic rise or tectonic shifts. Either way the result is a relative fall of sea level to land. Isostatic rise or rebound is caused by the landmass rising. During extended periods of glaciation massive ice sheets dominated northern Europe and America; in places the ice was several kilometers in thickness. This weight caused the continents to sink slowly into its mantle. Following the retreat of ice sheets during periods of warming the continents rebound. This rising up of the land increases the potential energy of the river. This energy is derived from the rise in elevation and the corresponding increase in gravitational force. In this circumstance, the river will begin again to cut down vertically, starting from the mouth in an attempt to reach it new base level. The point at which the river is cutting down is called the knick point. The knick point is a sudden break or irregularity in a river long profile where gradient increases suddenly. They are egenerally easily recognised in the long profile as they are marked by a waterfall or series of rapids. Howver some knick points can go almost unnoticed. This process begins at sea level and begins to retreat back up the long profile (see diagram above. The knick point represents where the old long profile joins the new one. Once a river rejuvenates, due to a fall in its base level, the river will begin cut down. In doing so it leaves behind abandoned river terraces that mark the previous level of the floodplain. If sea level continues to fall for an extended period of time, the knick point extends upstream beyond the middle course then incised meanders may develop. There are two types of incised meanders. 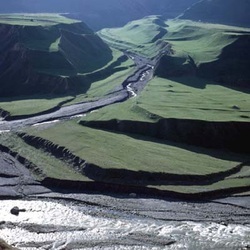 Entrenched meanders develop following a rapid incision of the river or when the valley sides are more resistent to erosion. Entrenched meanders have a symetrical valley profile, e.g. River Wear, Durham. Ingrown meanders occur when incision is slower and drawn out over a period of time. 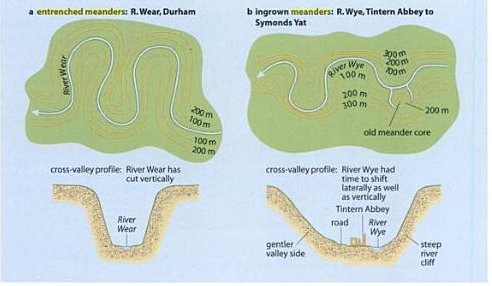 In this case the meander has time to erode both vertically and laterally to form an asymetrical river valley, e.g . River Wye, Tinton Abbey. Similar to typical meanders, incised meanders can also cut off a meander leaving behind a meander core. Rejuvenation is superbly illustrated in the time lapse video below and can also be seen in this animation showing how river terraces form.